e-news 09.1231 » New Year's Eve edition. Robert Scott & Great Bob Scott @ Pantages Hotel Martini Bar, Melissa Lauren sings w/ Nathan Hiltz on guitar @ Eight Wine Bar, and The JAZZ.FM91 New Year's Eve Radio Special. 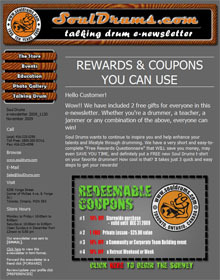 e-news 09_1218 » Soul Drums - Spectacular Boxing Day Savings!! 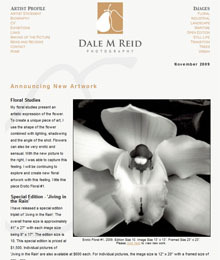 e-newsletter » News and upcoming events publication of Toronto, Canada based photographer. Newsletter 12_2009 » Seasons greetings from Rumberos. e-news 09.12 » The Cat*PR Twelve Days of Christmas. e-news 09_1218 » Soul Drums - Last minute, one stop shopping!! e-news 09.1217 » Upcoming Workshops @ Aangen Community Centre. adt! enews » mikey smith raw works festival. new collective members. adt! announcements. e-news 09.1211 » ~Night at the Indies~ is an independent, live multimedia event held monthly in Toronto & Vancouver..
e-newsletter » Summary of the various events, charitable dontations and contributions of volunteers during the past months. 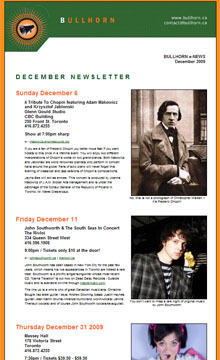 e-news 09.1201 » Tribute To Chopin featuring Adam Makowicz and Krzysztof Jablonski, John Southworth & The South Seas In Concert, Massey Hall’s New Year’s Eve Comedy Extravaganza, New Year's Eve with Robert Scott & Great Bob Scott, and LIFE'S LESSONS: A Successful Collection of Failures. e-news 09_1130 » Consumer survey edition with links for members to complete online survey for terrific gifts and in-store bonus incentives. 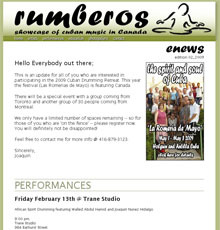 Newsletter 1128_2009 » News and upcoming performance schedule from Rumberos. e-news 09.1123 » ~Night at the Indies~ is an independent, live multimedia event held monthly in Toronto & Vancouver..
e-news 09.1116 » November/ December 2009 Workshops @ Aangen Community Centre. 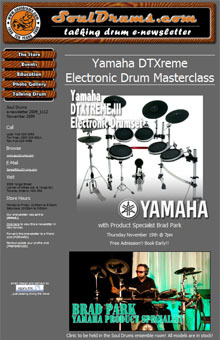 e-news 09_1112 » Soul Drums - Yamaha DTXreme Electronic Drum Masterclass, Soul Drums & Rumberos Cuba Retreat Reunion, and Teachers Training Course - One Drum One World!! 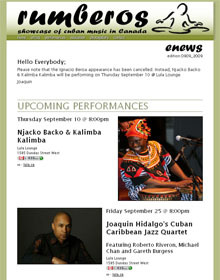 e-news 09.1111 » ~Night at the Indies~ is an independent, live multimedia event held monthly in Toronto & Vancouver..
Cajú Restaurant. Flavours Of Brazil. 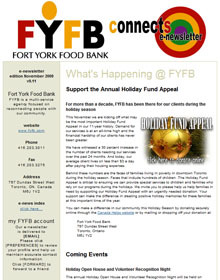 e-news 09.11 » Upcoming events enewsletter for popular downtown Toronto restaurant. Photography exhibit. 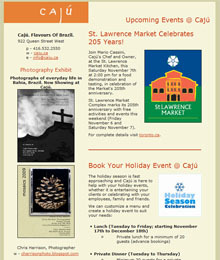 Join Mario Cassini as St. Lawrence Market Celebrates 205 Years. OLA | Of Latin America. Holiday Parties @ Cajú. 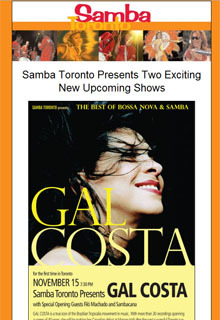 November 2009 News & Events » Samba Toronto presents Gal Costa, Filo Machado and Sambacana @ Massey Hall Sunday November 15.
e-news 09.1102 » November 2009 Workshops @ Aangen Community Centre. 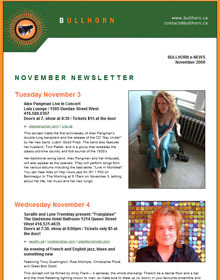 e-news 09.1102 » Alex Pangman @ Lula, Serafin and Lyne Tremblay present: "Franglaise", Third Annual Jazz Cares for the Philip Aziz Centre, Downchild Blues Band 40th Anniversary Celebration, The JAZZ.FM Sound Of Jazz Concert Series TM, and Scott Kemp @ The Rex Hotel in November. 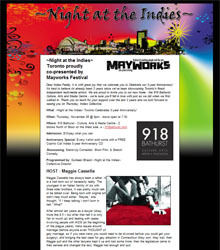 e-news 09.1021 » ~Night at the Indies~ is an independent, live multimedia event held monthly in Toronto & Vancouver..
e-news 09.1015 » October/ November 2009 Workshops @ Aangen Community Centre. newsletter » SPECIAL TORONTO EDITION - Upcoming performance at The Old Mill Saturday October 24 and SmoothJazzNow.com "On The Rocks" broadcasts at a new time every Saturday evening. 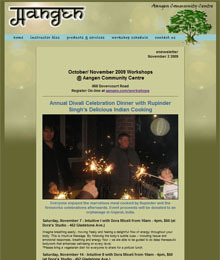 e-news 09.1002 » October/ November 2009 Workshops @ Aangen Community Centre. Newsletter 1001_2009 » News and upcoming performance schedule from Rumberos. newsletter » Upcoming performances, SmoothJazzNow.com "On The Rocks" broadcasts every Saturday evening, and online shopping made easy. e-news 09.10 » Fall is in the air and OCTOBER is a busy month for Cat*PR. e-news 09.1001 » Big Rude Jake Nuit Blanche Wedding Ceremony, Dave Brubeck: Live In Markham, One Stop Vocal Jazz Safari, The JAZZ.FM Sound Of Jazz Concert Series TM, Luanda Jones CD Release w/ Batucada Carioca @ Lula Lounge, Halloween Dance Party, and Meditation with Sachne Kilner. e-news 09.0925 » Special ScotiaBank Nuit Blanche edition. ~Night at the Indies~ Toronto Presents "Pimp Your Art" -- NUIT GLADSTONE IV. ~Night at the Indies~ is an independent, live multimedia event held monthly in Toronto & Vancouver..
e-news 09.0917 » September/ October 2009 Workshops @ Aangen Community Centre. newsletter » Upcoming performances and SmoothJazzNow.com "On The Rocks" broadcasts every Saturday evening. September 2009 News & Events » Samba Toronto presents workshops, dance lessons and Bateria practice w/ Alan Heatherington at the Royal Conservatory of Music. Newsletter 0909_2009 » News and upcoming performance schedule from Rumberos. e-news 09.0908 » 30 Years of This Ain¡¯t The Rosedale Library, The Brantford Jazz Festival, 'From the Heart' - A Benefit for the Toronto Humane Society, Big Rude Jake CD Release, The Sound Of Jazz Concert Series TMand Meditation with Sachne Kilner. e-news 09_0828 » Soul Drums - Fall education programs. Drum Set Lessons -- All Styles, All Levels!! Percussion Classes!! Djembe, Congas, Bongos, Timbales, Doumbek. 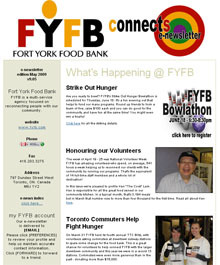 e-news 09.08 » Upcoming events enewsletter for popular downtown Toronto restaurant. Photography exhibit. Nuit Blanche. OLA | Of Latin America. TIFF and BRAFFT film festivals. e-news 09.0821 » ~Night at the Indies~ is an independent, live multimedia event held monthly in Toronto & Vancouver..
e-news 09.08 » A wurlwind of summer festivals for Cat*PR..
e-news 09.0727 » Electric-Eclectics Festival, Oshawa Jazz and Blues Fesstival, Markham Jazz Festival, Genevi?ve and *Schmingle*. e-news 09.0723 » ~Night at the Indies~ is an independent, live multimedia event held monthly in Toronto & Vancouver..
adt! enews » WORD! SOUND! POWAH! DUB THEATRE FESTIVAL :: jul 27-31. weekly advice. community announcements. enewsletter » Tax Alert - Summer 2009. Summary of articles by leading Toronto accounting firm. Newsletter 0711_2009 » News and upcoming performance schedule from Rumberos. e-news 09_0710 » Summer news and InStore specials. DAWG Studio recording session. New photogalleries for JoJo Mayer clinic/ 2009 Student Recital and Cuba Retreat. e-news 09.0703 » Dancing at Dovercourt House, Toronto Fringe Festival, Monkey Toast, 2009 Toronto Burlesque Festival "Tassels without Borders", Electric-Eclectics Festival and Batucada Carioca at UMA NOTA 2nd Anniversary Party. 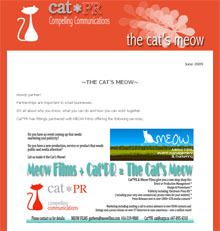 e-news 09.06 » Cat*PR partners with Meow Films, Catherine Bird Grant Writing and Infinity Communications Entertainment Division. e-news 09.0618 » June/ July 2009 Workshops @ Aangen Community Centre. e-news 09.0615 » ~Night at the Indies~ is an independent, live multimedia event held monthly in Toronto & Vancouver..
newsletter » New graphic design for Daniela Nardi enewsletter with Fan Club updates including recent articles in the press, and upcoming performances. e-newsletter #4 » Thursday June 18 Lula Lounge performance and other band news. 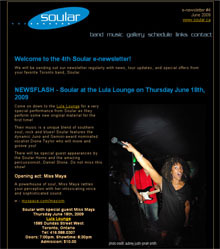 Formed in 2001 by the critically acclaimed Juno-Nominated jazz and blues vocalist Dione Taylor, and bassist/ bandleader Sandy Mamane, Soular has been laying down deep infectious grooves with soulful vocals and funky sounds..
e-news 09.0612 » BURL JAM ? A Tribute To Commemorate the 100th Anniversary of Burl Ives, WINE, DINE & ALL THAT JAZZ - A Benefit For Covenant House featuring Robert Scott, The One Stop Vocal Jazz Safari. A JAZZ.FM91 Fund Raising Event at Lula Lounge, and The Shuffle Demons Live At Nathan Phillips Square events. 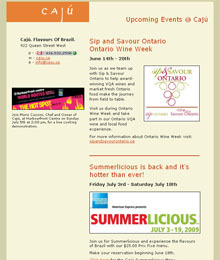 e-news 09.06 » Upcoming events enewsletter for popular downtown Toronto restaurant. Sip and Savour Ontario/ Summerlicious 2009/ The Hot Spot Festival at Harbourfront. Newsletter 0608_2009 » News and upcoming performance schedule from Rumberos. e-news 09.0601 » June 2009 Workshops @ Aangen Community Centre. e-news 09.0519 » May/June 2009 Workshops @ Aangen Community Centre. adt! enews » audre lorde workshop and may speshal events. course reminders. community announcements. 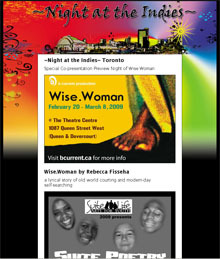 e-news 09.0514 » ~Night at the Indies~ is an independent, live multimedia event held monthly in Toronto & Vancouver..
enews 2008.03 » e-newsletter published by Toronto Canada based photographer. Focus on headshots. 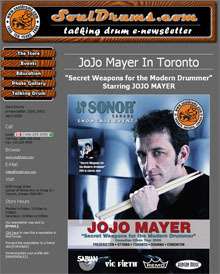 e-news 09_0507 » JoJo Mayer Visits Toronto. Dafnis Prieto Clinic & Performance photogallery. 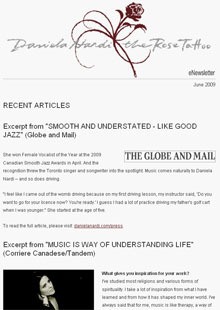 newsletter » Daniela Nardi wins 2009 Canadian Smooth Jazz Awards Female Vocalist Of The Year, May 14 2009 Lula World performance @ Lula Lounge, LCBO'S Food And Drink "Songs Of Comfort" review, and Twitter. e-news 09.0501 » JAZZ.FM91 Spring Fund Drive, KOLLAGE / The Rhythm Section with vocalist MICHAEL DANSO, Burlesque A La Carte, Terra Hazelton Releases 'Gimme Whatcha' Got¡¯, Burl Fest 100... a Tribute to the 100th anniversary of the birth of Burl Ives, TD Canada Trust Toronto Jazz Festival, and LulaWorld 2009 featuring Batucada Carioca and Samba Squad events. e-news 09.0430 » May 2009 Workshops @ Aangen Community Centre. e-news 09.0423 » ~Night at the Indies~ is an independent, live multimedia event held monthly in Toronto & Vancouver..
e-news 09.04 » Upcoming events enewsletter for popular downtown Toronto restaurant. e-news 09.0416 » April/ May 2009 Workshops @ Aangen Community Centre. 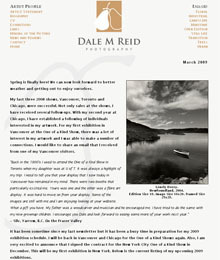 enewsletter » Tax Alert - Spring 2009. Summary of articles by leading Toronto accounting firm. 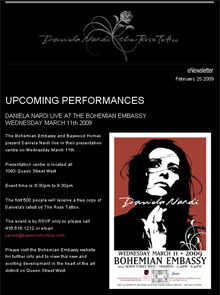 newsletter » Daniela Nardi performs at Lula Lounge May 14 2009 as part of the Lula World 7th year anniversary celebrations. e-news 09.0409 » ~Night at the Indies~ is an independent, live multimedia event held monthly in Toronto & Vancouver..
e-news 09_0402 » JoJo Mayer Visits Toronto. Brian Coe Rockin' In The Band and Cuba Retreat 2009 update. e-news 09.04 » What¡¯s the difference between Social Media and Social Media Optimization?. 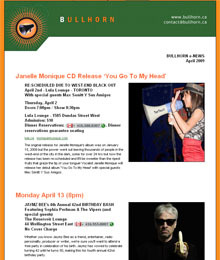 e-news 09.0401 » Janelle Monique CD Release, JAYMZ BEE's 4th Annual 42nd BIRTHDAY BASH, 8th Annual Jazz for Herbie, William Carn Quintet, Batucada Carioca @ Lula Lounge, Corktown Ukulele Jam, JAZZ.FM91 Spring Fund Drive and JAZZ Lives 2009.
e-news 09.0330 » March/ April/ May 2009 Workshops @ Aangen Community Centre. 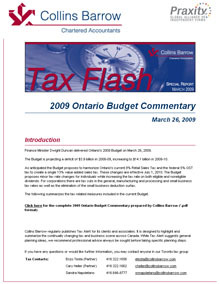 Tax Flash » 2009 Government of Ontario Budget Commentary prepared by Collins Barrow. e-news 09.0319 » March/ April/ May 2009 Workshops @ Aangen Community Centre. e-news 09.0316 » ~Night at the Indies~ is an independent, live multimedia event held monthly in Toronto & Vancouver..
adt! enews » new website coming. march speshal events. course reminders. community announcements. e-news 09.0304 » BECKY ABBOTT makes her Toronto debut during Canadian Music Week, Jaymz Bee's ROYAL JELLY ORCHESTRA plays the Oshawa Playhouse, DAVE HOWARD¡¯s 50th birthday bash, and SCENEandHEARD.ca - The Butterfly Effect. e-news 09.0302 » March/ April/ May 2009 Workshops @ Aangen Community Centre. newsletter » Daniela Nardi performs at Bohemian Embassy. 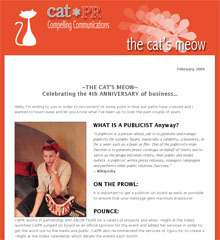 e-news 09.02 » Inaugural email newsletter for Cat*PR public relations and media communications agency. e-news 09.0218 » February/ March/ April 2009 Workshops @ Aangen Community Centre. 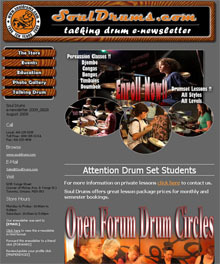 Newsletter 0212_2009 » Soul Drums and Rumberos Cuban Drumming Retreat 2009 Present Dafnis Prieto and his Toronto Quintet LIVE. e-news 09.0211 » ~Night at the Indies~ is an independent, live multimedia event held monthly in Toronto & Vancouver..
enews 2009.02 » Focus on headshots. adt! 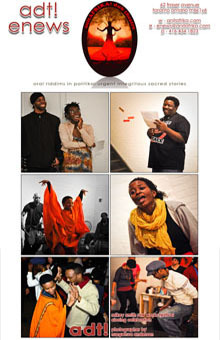 enews » afrikan herstory month speshal events. course reminders. community announcements. enewsletter » Tax Alert - Winter 2009. Summary of articles by leading Toronto accounting firm. e-news 09.0205 » Variety is the spice of life this month! Performances include the Bob Marley Tribute, BIG RUDE JAKE & The Quicksand Combo, DORIT CRYSLER, Sheila Jordan, The Swing Shift Big Band Valentines Dance, and Legendary Record Producer/Engineer KEN SCOTT. e-news 09.0204 » February/ March 2009 Workshops @ Aangen Community Centre. 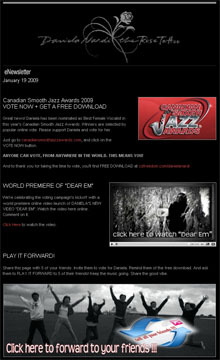 newsletter » Daniela Nardi nominated for a Wave 94.7FM Canadian Smooth Jazz award, video interview and other news. 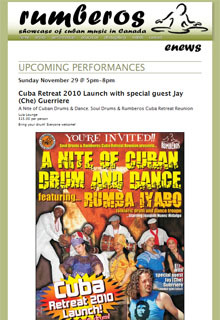 Newsletter 02_2009 » Cuba Retreat 2009 special announcement, performance schedule and upcoming Clinics & Workshops. e-news 09_0130 » Soul Drums beats the winter blues!! Drum Circles and Rumba Mondays Return. Tax Flash » 2009 Federal Budget Commentary prepared by Collins Barrow. e-news 09_01 » Annual Soul Drums Spring Retreat Weekend @ Cedar Glen. e-newsletter » Publication by popular singer | actor | arts educator. Award-Winning Collective bluemouth inc. Mount Their Latest Multidisciplinary Performance at Toronto Harbourfront Centre's Enwave Theatre. Winter 2009 News & Events » Fall Season Starts with Open House at the RCM!. 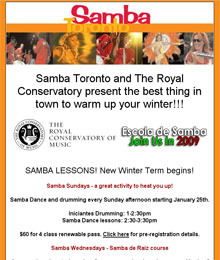 Samba Toronto presents workshops, dance lessons and Bateria practice w/ Alan Heatherington at the Royal Conservatory of Music. 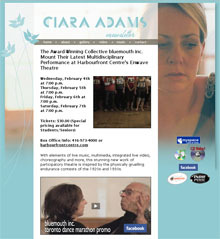 e-news 09.0120 » ~Night at the Indies~ is an independent, live multimedia event held monthly in Toronto & Vancouver..
e-news 09.0120 » January/ February 2009 Workshops @ Aangen Community Centre. newsletter » Daniela Nardi nominated for a Wave 94.7FM Canadian Smooth Jazz award, music video shoot w/ photo and other news. adt! enews » new year - new schedule. mikey smith new works festival photos. community announcements. 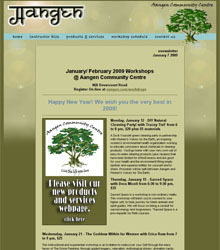 e-news 09.0107 » January/ February 2009 Workshops @ Aangen Community Centre..